During an anthrax outbreak in 2014 in the endemic Pafuri region, blowflies associated with two 2-3-day-old anthrax-positive carcasses (kudu and impala) as well as surrounding vegetation were collected and investigated for the presence of B. anthracis spores. Chrysomya albiceps and Ch. marginalis have the potential to disseminate B. anthracis to vegetation from infected carcasses and may play a role in the epidemiology of anthrax in the KNP. No B. anthracisspores were initially isolated from leaves of the surrounding vegetation using selective media. However, 170 and 500 spores were subsequently isolated from Abutilon angulatum and Acacia sp. leaves, respectively, when using sheep blood agar. A number of abiotic and biotic vectors such as insects (biting flies, blowflies, mosquitoes and ticks) (Blackburn et al. 2010; Fasanella et al. 2010; Graham-Smith 1913; Turell & Knudson 1987), scavengers (Pienaar 1961, 1967), soil (Hugh-Jones & Blackburn 2009) and water (Hugh-Jones & De Vos 2002; Pienaar 1961) have also been implicated in the dissemination of anthrax. The main insect vectors implicated with anthrax in the KNP are the blowflies Chrysomya albiceps and Ch. marginalis(Braack 1985) as these species are the first (and most abundant) insects to arrive shortly after death. These two species consume infected bodily fluids and are probably the principal vectors in the dissemination of B. anthracis (Braack 1985; Braack & Retief 1986). Chrysomya albiceps and Ch. marginalis have been hypothesised to spread the bacteria over short distances despite the fact that blowflies have the ability to travel great distances (35 km - 65 km). They normally rest on nearby vegetation when engorged and deposit most of the contaminated defaecation and/or vomit droplets close to the carcass (Braack & De Vos 1990; De Vos 1990) of vegetation (reviewed by De Vos 1994), which pose a risk of infection to susceptible herbivores. In this study, we investigated the possible role of blowflies in carrying and/or spreading B. anthracisduring an anthrax outbreak in the KNP. This aim was investigated by quantifying the presence of B. anthracis on the exterior and interior of blowflies after feeding on an anthrax-contaminated carcass. Furthermore, the role of blowflies in the dissemination of B. anthracis onto the surrounding vegetation during the anthrax outbreak in the KNP was also investigated. 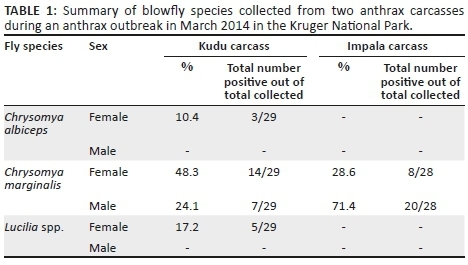 In March 2014 - April 2014, blowflies were collected from two confirmed anthrax-positive carcasses (a kudu and an impala) during an anthrax outbreak in the endemic Pafuri region of the KNP. The adult male kudu carcass was approximately 2-3 days old, lying in the open with clear indications that scavengers (vultures and/or hyenas) had started to feed on it. The adult male impala carcass infected with anthrax was about three days old, lying under a low thorn tree (Acacia sp.). The carcass was mostly intact, except for a large opening in the abdomen region. A net trap was used to collect the blowflies on the carcass. Trapped flies were collected and placed in liquid nitrogen for 30 seconds and transported at 4 °C to the National Institute for Communicable Diseases (NICD) for further bacteriological analysis. All blowflies were kept, while other flies were discarded. Each blowfly was identified and sexed using the identification method described by Zumpt (1965). Blowflies that were not phenotypically or morphologically distinguishable were identified by sequencing of the ribosomal DNA internally transcribed spacer 2 (ITS 2) region that differentiates Calliphoridae as described by Koekemoer et al. (2002). Each blowfly was tested for the presence of B. anthracis vegetative cells and spores on the interior and exterior surfaces. To detect the presence of B. anthracis on exterior surfaces, each blowfly was washed in 1 mL sterile saline to remove any bacteria. The presence of B. anthracis vegetative cells was determined by plating 10-fold dilutions (100-108) from the external wash onto polymyxin-EDTA-thallium acetate (PET; modified polymyxin-lysozyme-EDTA-thallium acetate [PLET] where lysozyme was omitted) agar plates followed by incubation at 37 °C for 48 hours. The presence of B. anthracis spores was determined by plating 100 µL heat-treated (62.5 °C for 15 min) undiluted external wash on PET agar, followed by incubation at 37 °C for 48 h.
After the exterior wash step, each blowfly was disinfected with 1 mL 0.1% (v/v) peracetic acid for 1 h to inactivate any residual bacteria left over on the exterior of the blowfly after the wash step. The 0.1% peracetic acid (v/v) was neutralised by 1 mL 0.8% sodium bicarbonate - sodium chloride (v/v) solution for 1 h. One-hundred microliters of the neutralised external wash was inoculated onto 5% sheep blood agar (SBA) and incubated at 37 °C for 24 h to ensure that no bacteria were present on exterior surface of the blowflies. The presence of internal (ingested) B. anthracis was determined by homogenising each blowfly in 1 mL saline. The homogenised blowfly was briefly centrifuged (500×g for 5 s) to separate the blowfly debris from the supernatant. Tenfold serial dilutions (100-108) of the supernatant were prepared and plated on PET agar and incubated at 37 °C for 48 h. The presence of B. anthracis spores was determined by plating 100 µL heat-treated undiluted supernatant onto PET followed by incubation at 37 °C for 48 h.
Chrysomya albiceps, Ch. marginalis and Lucilia spp. were collected from two B. anthracis carcasses and their abundance confirms that these carcasses were 2-3 days old as indicated by the investigation of carcass-attending insect communities in the KNP of Braack (1985). Chrysomya marginalis usually arrives within a couple of minutes to hours after death of animals and stays at a carcass for approximately 4 days, whereas Ch. albiceps arrives a couple of hours after the death and remains at a carcass for about 3 days in the KNP (Braack 1985). Lucilia spp. usually arrives at the same time as Ch. marginalis, but in far less numbers. The major blowfly species collected from anthrax-infected carcasses was Ch. marginalis of which 88% was B. anthracis culture-positive. No viable B. anthracis was isolated from any of the vegetation using selective media and could only be isolated using SBA. Based on the culture results using selective (PET) and enrichment (SBA) media, it seems that the selective medium has an inhibitory effect on B. anthracis spore germination from leaves, which was not the case with germination from the blowflies themselves. Because of initial negative results of the selective media from the A. angulatum leaves, we tested for antibacterial activity and found a moderate inhibitory effect on the non-virulent Sterne strain of B. anthracis by phytocompounds within A. angulatum. Only spores, and no vegetative organisms, from B. anthracis were isolated from the interior and exterior of blowflies, which could be attributed to various factors that could have killed the more labile vegetative organisms. These factors include the freezing of the flies in liquid nitrogen, collection time and the period between collection and processing of the flies. Graham-Smith (1913) fed Musca domestica and Calliphora erythrocephala on B. anthracis vegetative cells and spores and recovered only B. anthracis spores for up to ten days from fly legs and wings and seven days from both the gut and the crop. Vegetative cells were present on legs and wings for up to 24 h, lending further evidence to our findings. In this study, the collected flies were frozen in liquid nitrogen. Haines (1938) found that 90% B. mesentericus spores were viable after -70 °C freezing with varying loss of viability of the vegetative cells and Young et al. (1968) suggested that vegetative cells of spore-forming bacteria are more susceptible to damage from freeze-thawing than vegetative cells of non-spore-forming bacteria. Therefore, it is presumed that the freezing of the flies in liquid nitrogen did not influence the spore count significantly, as we only found spores. The absence of vegetative cells could be because of the use of liquid nitrogen to kill the blowflies. Two recent studies investigated fly species as potential mechanical or biological vectors of B. anthracis.Fasanella et al. (2010) allowed the common housefly (M. domestica) to feed on B. anthracis-infected rabbit carcasses or B. anthracis-contaminated blood and indicated the presence of B. anthracis spores in defaecation or vomit spots as well as hypothesised that anthrax spores are able to germinate and replicate in the gut content of M. domestica. These authors hypothesise that the housefly has the potential to act as a biological vector for B. anthracis. Von Terzi et al. (2014) demonstrated that B. anthracis vegetative cells are unable to multiply inside the gut of Calliphora vicina and cannot survive for longer than a week. These authors' results show high numbers of viable B. anthracis indicating the role of C. vicina as only mechanical vectors as previously hypothesised (Blackburn et al. 2010; Hugh-Jones & Blackburn 2009; Hugh-Jones & De Vos 2002). As anthrax carcass sites are the primary sources for future infections (Turner et al. 2014, 2016), it will depend if the spore doses from surrounding infected vegetation are lethal. Considering the 170-500 spores per leaf or twig (that weighed approximately 1 g - 2 g) found in this study, a lethal dose of around 105-107 for gastrointestinal anthrax (Turner et al. 2016) can easily be ingested during anthrax outbreaks as impala ingests 0.9 kg - 1.9 kg per day (Furstenburg 2002) and kudu 3.7 kg - 5.0 kg per day (http://www.wildliferanching.com/content/kudu-tragelaphus-strepsiceros). However, because of the small sample size (host species and blowflies), further research is necessary to investigate the spore load present in the different host species and CFU on and defaecated by the different blowfly species.